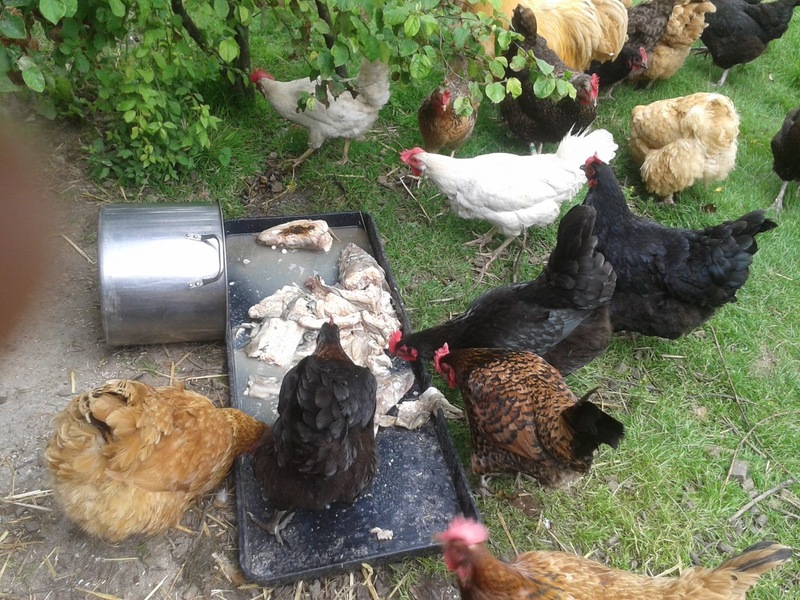 Here are the hens converging on their "fishy bits" (What no chips?!) They will peck away until just the bones are left and as clean as a whistle. These I will carefully dispose of as they can be very sharp. The fish takes very little to cook, just a pint of water from the kettle poured onto the bits and five minutes heating on the gas will suffice as the fish carries on cooking if the lid is left on until cold. I noticed that the jackdaws and the crows are sitting in the trees waiting for me to leave so I hung around for a bit, using this time to fish some of the duck weed out of the pond, which is to the right of this picture. Below is a picture of one side of the paddock, all nicely cut and ready for the party at the weekend. 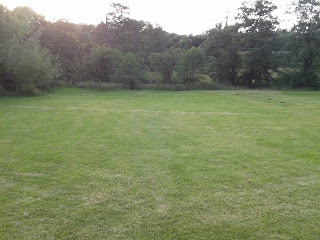 I'm not sure if you can make it out but the edge of the paddock is left rough and is lined with trees. We planted these trees over the last thirty years. They all indeginous and have a purpose either for ourselves or the wildlife and collectively they are a joy. I'm not sure if I have said before but we use no chemicals whatsoever on our smallholding, so the wildlife that visit us and of course our bees are safe. Tonight we had leftovers for tea (surely not!) Some of yesterdays vegetables covered in the remaining onion sauce and topped with mashed potatoes and a sprinkle of cheese. We had this with some of the cold ham. I also had a few pickled onions with mine, because I fancied them !! It's a good job I'm over a certain age or D. would be worried about me having weird food fancies! Shara asks how I make onion sauce. Here it is and I know Shara is comfortable with iffy amounts! Finely chop a large onion and cook gently in a couple of tablespoons of margarine or butter. When soft, add a couple of tablespoons of flour. Cook for a minute before gradually adding milk until the required thickness is reached. Season to taste. As you can see this a really a basic roux. I'm going to try for an early night tonight and it is already 10.30, so I will love you and leave you. Thank you so much! Similar to what we would call an onion gravy here. Funnily enough in the Southern US we call most sauces gravies. Sometimes we'll use the "juice" from cooked meats instead of milk, but same idea. weird isn't it ? A bit like the jam and jelly thing!